Featuring a secure locking chamber and manufactured from food grade materials, the Dragon WP Seal from Mega Fortris is a preferred product in industries where a quality plastic seal with a high degree of security is required. Dragon WP plastic security seals are available in 250mm and 400mm lengths and feature a large tag area that can easily fit information such as company logo and numbering using the latest in laser engraving technology. 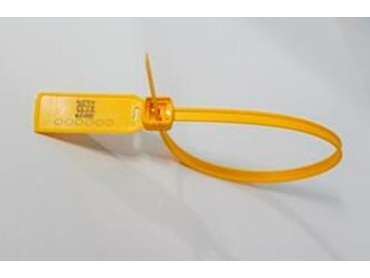 As well as being widely used within the hospital and medical industries, Dragon WP seals are used within the cash handling industry since these plastic security seals have large bag spikes on the tail, which bite into the neck of cash bags to eliminate attempts to remove them. The Dragon WP plastic security seal has a breaking strain exceeding 50kgs, and is also one of the easiest plastic seals to apply, which makes the Dragon WP seal an ideal choice for high security needs.